A highly underutilized anesthesia technique called neuraxial anesthesia, also known as spinal or epidural anesthesia, improves outcomes in patients undergoing hip or knee replacement, according to a new study by researchers at Hospital for Special Surgery. 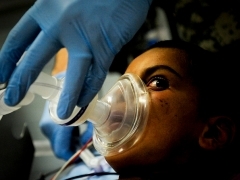 The study, which appears in the May issue of the journal Anesthesiology, found that neuraxial anesthesia, a type of regional anesthesia, reduced morbidity, mortality, length of hospital stay and costs when compared with general anesthesia. "The influence that the type of anesthetic can have on perioperative outcomes has been vastly underestimated. Indeed, our study suggests that the type of anesthesia chosen may have important impacts on all kind of medical and economic outcomes in orthopedic surgical patients," said Stavros Memtsoudis, M.D., Ph.D., director of Critical Care Services at Hospital for Special Surgery, New York City. "It is not something to be taken lightly." The findings of this comparative effectiveness research could be applied to over one million patients undergoing joint arthroplasty in the United States each year. Using neuraxial anesthesia over general anesthesia reduced the risk of pulmonary compromise by twofold in knee replacement patients and over threefold in hip replacement patients. "When one considers the modest decrease in risk of adverse outcomes associated with the use of a number of widely used medications such as anti-cholesterol drugs, the effect sizes seen in this study are really impressive," said Dr. Memtsoudis. Neuraxial anesthesia involves injecting medication into fatty tissue that surrounds the nerve roots in the spine (known as an epidural) or into the cerebrospinal fluid that surrounds the spinal cord. 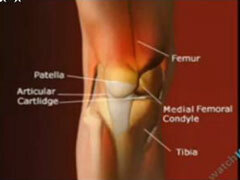 Currently, the majority of joint replacements in the United States are performed under general anesthesia. Anesthesiologists at the Hospital for Special Surgery, however, use regional anesthesia for over 90% of hip and knee replacements. In the past, several small studies have shown that compared with general anesthesia, regional anesthesia reduces intraoperative blood loss and the need for blood transfusions. In the new study, researchers at Hospital for Special Surgery conducted a retrospective review of hip and knee replacements performed between 2006 and 2010 in the United States using data collected by Premier Perspective. This administrative database contains discharge information from approximately 400 acute care hospitals located throughout the United States. Information on the type of anesthesia used was available in 71.4% of 528,495 patients. Eleven percent received neuraxial anesthesia, 14.2% received combined neuraxial and general anesthesia, and 74.8% received general anesthesia. Thirty-day mortality was significantly higher in patients who received general anesthesia, 0.18%, compared with those who received neuraxial, 0.10%, or neuraxial-general, 0.10%. "Other studies have suggested some benefit of neuraxial over general anesthesia, but they looked at very limited outcomes, primarily at risk of bleeding and blood transfusions. What this study does for the first time is really explore the impact of anesthesia on a wider range of important outcomes," said Dr. Memtsoudis. "We found lower rates of complications including pulmonary compromise, pneumonia, infections, and acute renal failure when neuraxial anesthesia is used. The choice of anesthesia seemed to basically affect every organ system." When patients who received general anesthesia were compared to patients who received neuraxial or a combination of neuraxial and general, they were found to have higher rates of pulmonary compromise (0.81% vs. 0.37% vs. 0.61%), infections (4.5% vs. 3.11% vs. 3.87%) and acute renal failure (1.75% vs. 1.1% vs. 1.43%). Neuraxial anesthesia was also associated with shorter hospital stays and lower health care costs. Patients were defined as having a prolonged hospital stay, if they fell in the 75th percentile of the study cohort in terms of stay duration. The researcher found that more patients receiving general anesthesia (35.4%) had a prolonged hospital stay than patients who received neuraxial (28.7%) or neuraxial and general (27.4%). Patients were less likely to fall into the upper 75th percentile in terms of health care costs if they received neuraxial anesthesia (21.4%) or combined neuraxial-general (18.3%) than in the general anesthesia group (23.4%). "Patients were 30% more likely to be in the group that had the highest costs if they received general anesthesia alone," said Dr. Memtsoudis. Anesthesia medications used during surgeries are a small fraction of overall health care costs, and the costs of regional and general anesthesia are similar. Dr. Memtsoudis pointed out that educating patients is key. "Some patients don't like the idea of having an injection in their back and their legs being numb, but a thorough discussion of risks, benefits and alternatives can go a long way to help an educated patient make rational decisions," he said. "For the anesthesiologist, a number of factors come into play, including patient comorbidities and preferences as well as other practice specific factors, such as the choice for anticoagulation, but regional anesthesia should, at the very least, be considered in every patient." While randomized clinical trials are the gold standard of clinical research, such trials are not feasible for testing anesthesia technique in joint replacement surgeries, because the low incidence outcomes would require a huge number of patients.